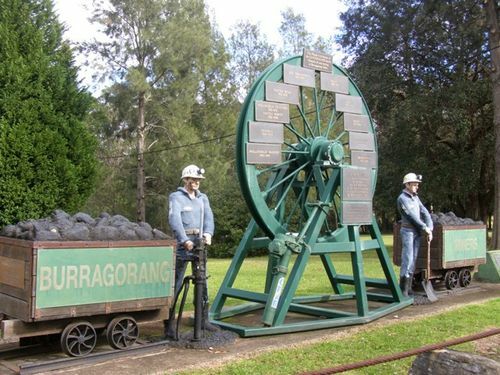 Monument commemorates the contribution of the people in the coal industry of the Burragorang valley. It is also dedicated to the men who lost their lives in the coal mining and other associated industries in the Burragorang Valley. With the closing of Brimstone No.1 Colliery in 2000 and when the last shift was worked at Wollondilly Washery on 15th June 2001, the coal-mining era in the Burragorang Valley came to an end. Since the first coal was mined in 1878, when the Nattai Mining Company was established, and more so since the 1930’s, when the Clinton and Fox families pioneered and established their mines, the whole district has been touched in some way by the mining industry. the CLINTON & FOX family. Brimstone Lodge. Joint Coal Board. Camden Signs. Macarthur Credit Union. C.P.E. Tree Services. Nepean Engineering.